Iberian acorn ham on the bone. Slices of ham from Jabugo. Aged in cellars in the town of Corteconcepción for at least 36 months. Slices directly cut from whole legs from acorn-fed pigs are also available in our shop. Over 100g of ham, hand-cut by the producer at their facilities. Immediately after slaughter, these hams spend fifteen days in sea salt before being placed in cold storage. Next they go in the dryer for three consecutive summers, where the fat melts - this is the ham "sweating". 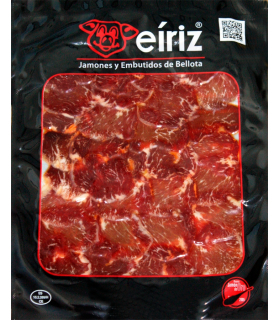 It takes three years of curing in the warm air of the mountains and the sea for the fat to melt and permeate the meat. This ham is eaten at room temperature. 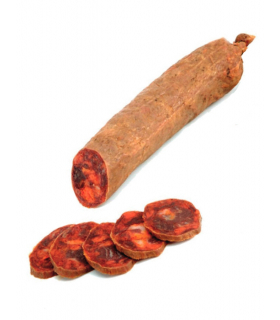 It is recommended that you open the packaging at least half an hour before eating, to maximise the aromas. Knife-sliced ham. These vacuum packs contain 100 grams of pure pleasure for the senses! Keep refrigerated, unopened - 9 months.